The Limited Liability Company (LLC) is a smart entity choice for many start-up businesses. The LLC provides personal liability protection and has the potential to save money on taxes. With a little research, you can learn how to form an LLC in Wisconsin without an attorney. Forming an LLC in Wisconsin can be both affordable and is simple enough for most people to start on their own. That said, it’s not a bad idea to have a legal professional like While the filing is pretty straightforward, it’s nice to have some support if you have questions, alerts when the annual report is due, forms like operating agreements, banking resolutions and more. There are companies like IncFile or Swyft Filings and others that do all of this for only $49. To form a Limited Liability Company in Wisconsin, file the Articles of Organization with the Wisconsin Department of Financial Institutions. The LLC filing fee online is $130 and $170 by mail. Approval for the LLC is typically around five days. Expedited service is available for an additional $25 which only takes 24-hours. If you have questions, contact the Wisconsin Department of Financial Institutions. Begin by visiting the Wisconsin Department of Financial Institutions’s website. Select “Click here to start filing” at the bottom of the page. Enter the name you want for the LLC. The name of the LLC has to differ from other entity names registered with the Department of Financial Institutions. You can also check on available LLC names in Wisconsin before going through the filing process to be sure the one you want is available. Pay careful consideration to any periods as a missing period may impact the approval of the Articles of Organization. Enter the name along with the designator you would like to use and click on “Check Name Availability” A new page will open indicating whether the name is available or not. Even if the search comes back with the name is available, the Department of Financial Institutions’s office will also review it to be sure it isn’t being used by someone else or that it is too similar to another name. Generic language stating the the LLC is organized under Chapter 183 of the Wisconsin Statutes. This language is needed in order to form an LLC in the state and no action is needed. To have an LLC in Wisconsin, a Registered Agent must be identified. The Registered Agent act as a single point of contact to receive legal documents, tax notices, summons, subpoenas, etc on behalf of the LLC. The Registered Agent can either be a resident of Wisconsin, a Wisconsin registered entity which could be an attorney, accountant, etc. or a Registered Agent service. If it’s an individual, enter their name. If it’s not an individual, click “Select Entity” to search the name in the state’s database. The Registered Agent must have a physical address in the state and PO Boxes are not allowed. This address may be the address of the LLC, but it doesn’t have to be. Enter the address information in the address fields. This section asks if the LLC is Member-Managed or Manager-Managed. An LLC Organizer is someone involved with the formation of the Articles of Organization. The Organizer may or may not become a member, such as a mentor, attorney or accountant, but any of the initial members can be listed as an organizer. Enter the name and address of each organizer. The drafter is the person who entered the information into the Articles of Organization and their name needs to be included in this section. This is likely one of the members, attorney or entity formation service. This is an optional section, but if you want the Limited Liability Company to start on a later date, click the “Declare Delayed Effective Date” button and then enter a date less than 90 days in the future. The main reason for delaying the LLC start date is when the filing is being done close to the end of a calendar year and the business isn’t going to have any activity until the start of the year. By delaying until the following year they will reduce the number of end-of-year filings. By not selecting anything, the effective date will be the date when the Department of Financial Institutions files the Articles of Organization. Have at least one organizer sign the document by selecting their name. Click “Next” and enter their name, address, email and phone number. Those signing will be the point of contact should there be any issues with the filing of the Articles of Organization. If there are no issues, in approximately 5 business days (with standard processing), the LLC will be approved. That concludes the basics of forming an LLC in Wisconsin. Remember, even though you can do it yourself, there is more to an LLC than just the filing. 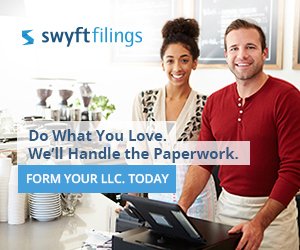 If you have questions, work with an attorney or a specialized entity formation company such as IncFile or Swyft Filings to make sure everything is done correctly. Last, before starting a business in Wisconsin, you may still need to apply for business licenses, sales tax permits, self-employment taxes and more in Wisconsin. See the Guide to Starting a Business in Wisconsin for more information.